These earrings have a story to tell. Unfortunately, we don’t know most of it. They were most likely made in Constantinople around 600 CE, perhaps as an imperial gift to a Visigothic ruler of medieval Spain, where they were found in Extremadura. The Visigoths by that point had become the settled rulers of the Iberian Peninsula, and had established trade and diplomatic contacts with the Byzantine Empire. 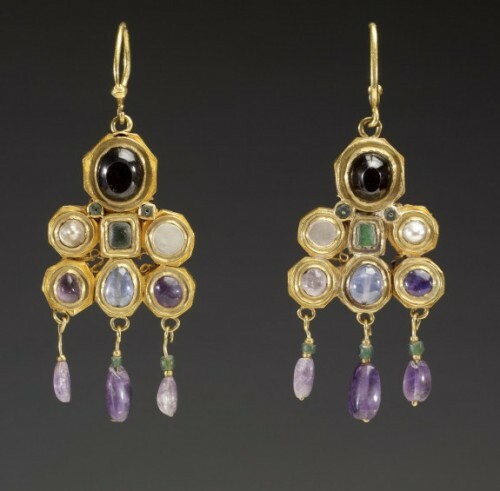 And its known that the Visigoths particularly prized Byzantine jewelry. Charles Darwin brought back a tortoise from the Galapagos Islands. She was five years old, and he named her Harriet. Harriet long outlived Darwin, and passed through a number of owners – the last being Steve Irwin. Harriet died in 2006 at the ripe old age of 176.